Yes, there are the famous faces: Albert Einstein, Marilyn Monroe, Mark Twain, Muhammad Ali. But there are plenty of others, too — people whose stories are interwoven into the fabric of the West, even if their faces and names might elude most observers, from inmates to steelworkers to civil rights activists. Together, these faces will fill the gallery at The Bancroft Library for nearly an entire year for a stunning new two-part exhibition made up entirely of portraits. 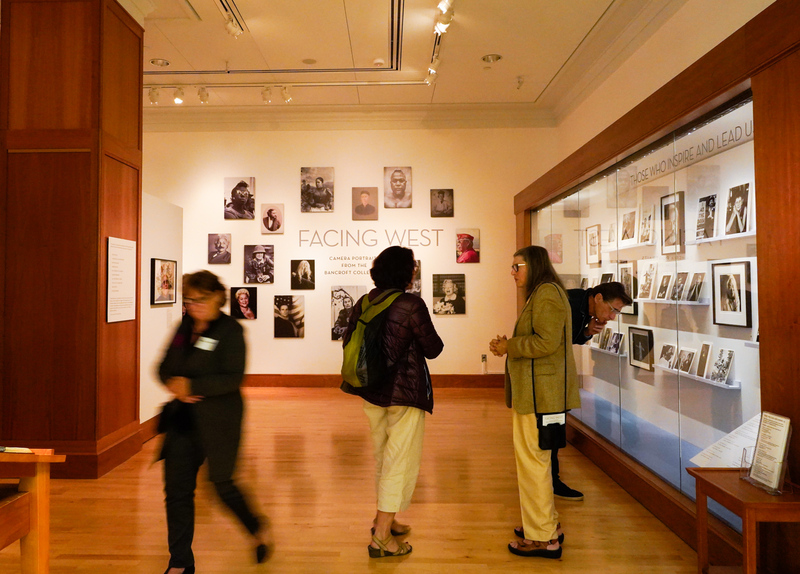 Opening Friday, Facing West: Camera Portraits from the Bancroft Collection includes about 150 photographs, which span from around 1850 — the early days of photography in the West — to the present day, highlighting some of the most compelling portraits in Bancroft’s pictorial collection. Divided into 10 themes (among them “Those who inspire and lead us,” “High society,” and “Where we live”), the final selection of portraits run the gamut, focusing heavily on Bancroft’s Western Americana and Latin Americana collections. A photograph by David Johnson shows a stoic-faced woman at a demonstration during the height of the civil rights movement, the reflection of an American flag in her browline glasses. A 1973 portrait by Michelle Vignes captures Russell Means, among the most prominent forces in the American Indian Movement, in what appears to be a quiet moment of reflection. A piece by Clifford Baker captures a participant in the San Francisco AIDS March — donning lace, strands of pearls, and a somber expression — reflecting the fragile joy of the LGBTQ community at a time when it was fighting not only for rights, but for survival. But which photos are the curators’ favorites? “That’s like choosing what child is your favorite,” von Euw said. While he couldn’t pick just one, among them is a stunning portrait of Muhammad Ali by Howard Bingham, the son of a Pullman porter and a lifelong personal friend of Ali. 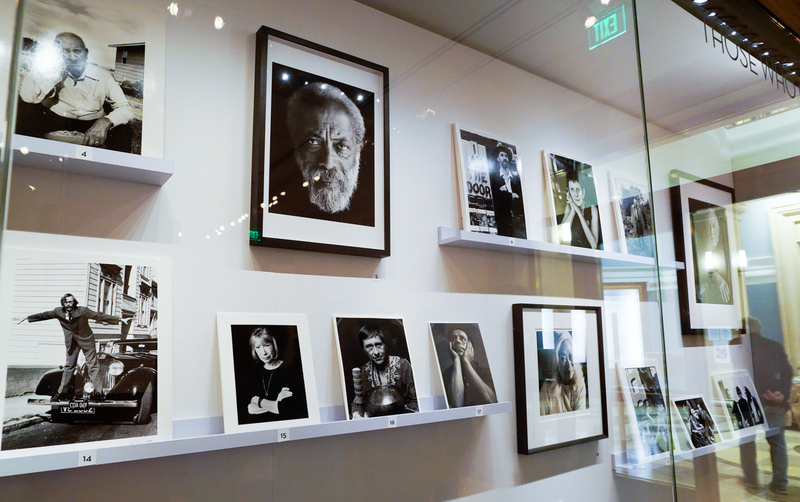 Hult-Lewis points to Berkeley-based photographer Judy Dater’s black-and-white photo of celebrated author Maxine Hong Kingston as one of her favorites. From 2015, it is the most recent photograph in the exhibit, depicting Kingston wielding a sword — a nod to the author’s most famous book, The Woman Warrior. A visitor is reflected in a portrait in the gallery. “It’s a really striking portrait,” Hult-Lewis said. Along with the subjects, the sizes of the portraits vary, ranging from just a few inches to several feet across. A particularly large piece, for example — a 1924 panorama of photographer Taizo Kato’s funeral — measures more than 4 ½ feet wide. As for the oldest item? That would be a daguerreotype of Don José Estudillo, an early Californio, dating back to 1851. In March, Bancroft will swap out about half of the photos in the exhibit, which will not only give visitors a more dynamic and varied experience, but also allow the library to preserve the physical integrity of some of the more sensitive photographs by providing them a respite from the gallery lights. “It is vitally important to preserve these photographs for years and years into the future — for the coming generations to benefit from them as we have,” von Euw said. The curators hope the photos will inspire visitors to look further into Bancroft’s collections and discover the gems that lie within. The exhibit represents just the tip of the iceberg — or, perhaps, a snowflake on the tip of the iceberg — of Bancroft’s pictorial collection, which numbers about 9 million items, including photo negatives. “We think it’s the second biggest (pictorial collection in the country),” behind the Library of Congress’ collection, von Euw said. 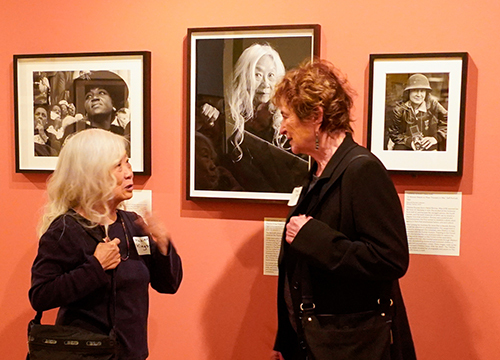 Top to bottom: Left to right: Photographer David Johnson tells visitors about one of his portraits in the Facing West exhibit; author Maxine Hong Kingston, left, speaks with photographer Judy Dater in front Dater’s portrait of her. 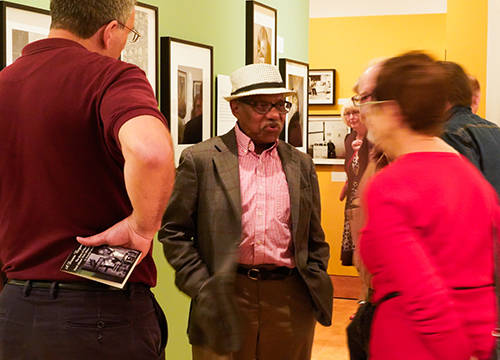 Although the exhibit touches on a range of events and historical periods — the Gold Rush in the mid-1800s, the civil rights movement of the 1960s, and many more — the goal is not to encapsulate any one moment in time. 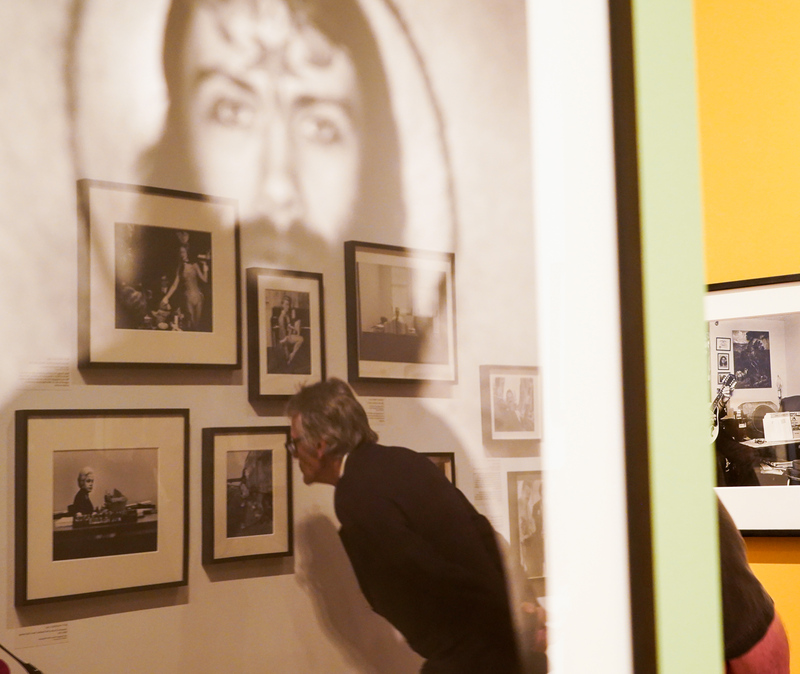 Around 90 photographers are represented in the exhibit, from well-known figures such as Dorothea Lange and Judy Dater to those who are lesser-known but whose work is vitally important.